Popular grandstands sell out fast. Buy Monaco Grand Prix tickets from these official retailers. 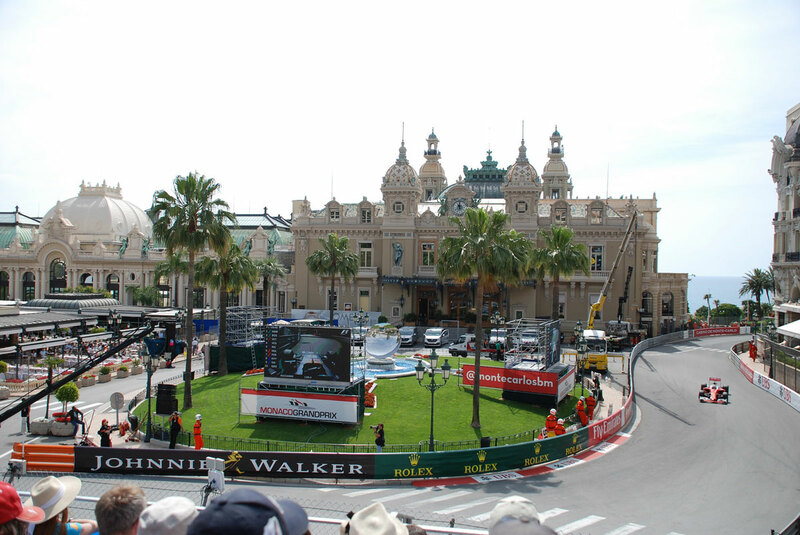 There are a number of great options to see the Monaco Grand Prix live. Here I’ll go into detail about the pros and cons of la Rocher general admission area and share a few tips for fans planning to watch the race from here. 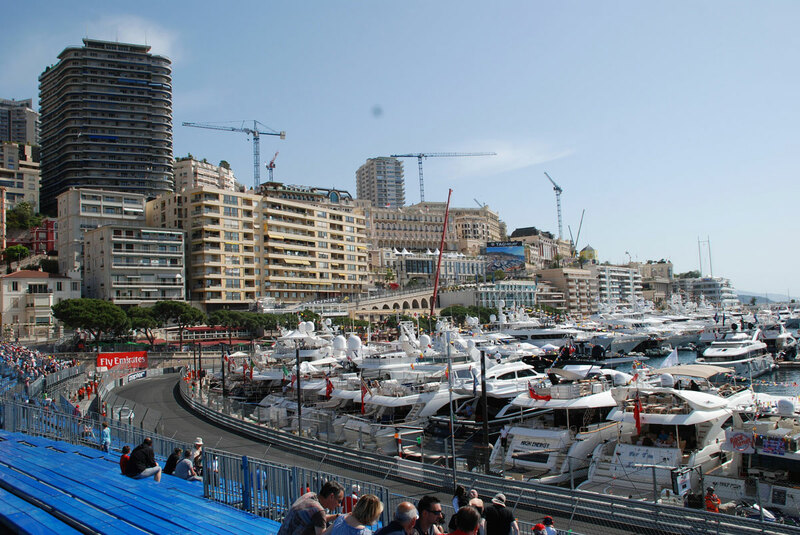 First though let’s look at some of the best grandstands in Monaco. 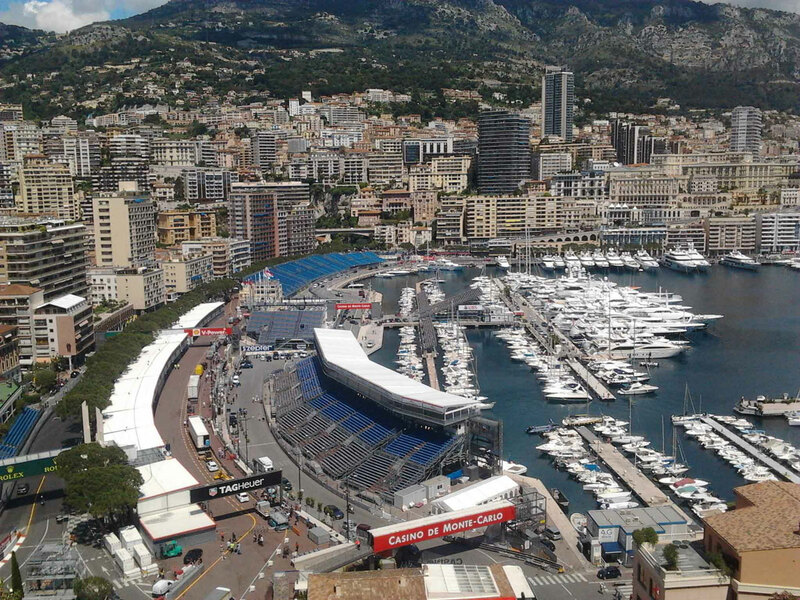 At Monaco it is possible to buy 1 day tickets for each and every grandstand meaning you can try a new one each day and get a varied viewing experience of the famous street circuit. Grandstand K is a long stand facing the habour stretching from Tabac right around to the beginning of the swimming pool section. The left side has a view of the cars from the chicane at the exit of the tunnel, along the harbour edge where just a barrier and a wire fence separates them from the sea and into the fast, left hand Tabac. The right section of K Grandstand looks over the apex of the fast entrance to La Picine up to the following tight chicane. It’s worth getting an upper level seat here and have the benefit of a clear view over the catch fencing. Behind the grandstand is the start finish straight and the run down to the first corner of St Devote which adds another dimension for the spectators on the top row of the stand, but it is mostly obscured by trees. These are not the best views at Monaco but what you get from K Grandstand is a nice overall, dynamic experience that is unmistakably Monaco and some of the best atmosphere at the Grand Prix. Grandstand T is located on a short burst of a straight between the swimming pool section and the penultimate Rascasse corner. The top section of T has a view of the pits and a higher price tag to reflect this. 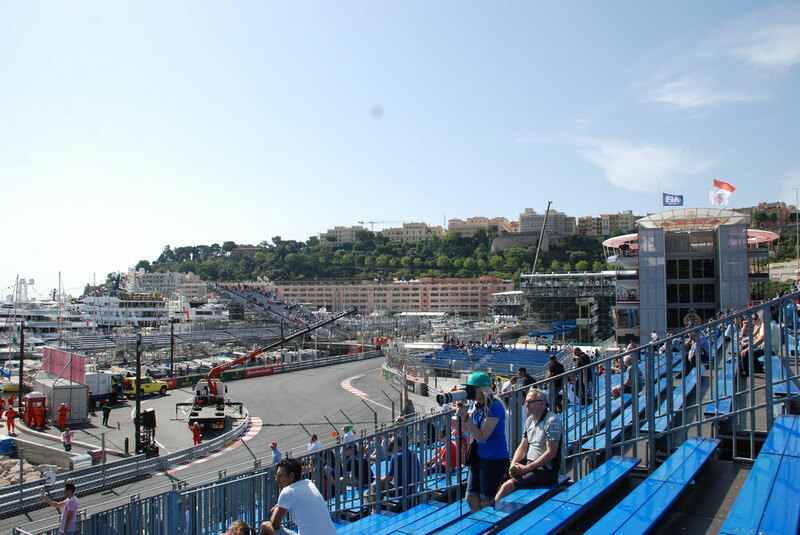 The view from from the upper level on the right hand edge of the stand is arguably the best Grandstand view at Monaco. Seeing the cars come towards the chicane through the Swimming Pool section, unobstructed by catch fencing and slow right down for the chicane before getting hard on the power as soon as grip levels allow it is about as good as it gets for an F1 fan at Monaco. Also being able to see the pit lane action – albeit the lower end teams – and a TV screen means you’ll never feel bored here. Further along towards Rascasse things are not so exciting. In the midpoint you are really just seeing cars flash past in a straight line, which gets old really quickly. At least from the top you can see into the pits and all seats have a clear view of the giant screens. 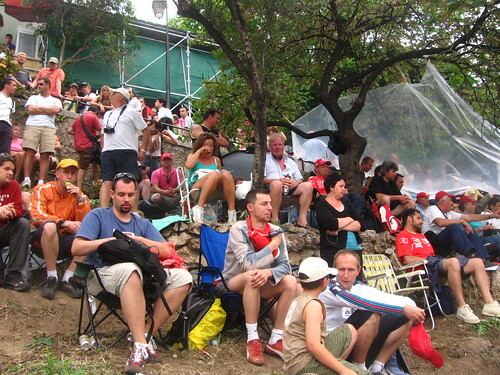 On the right hand side of the stand spectators see the drivers brake for Rascasse and across from the stand, in the pits directly opposite are the top teams on the grid. Most seats have a very limited view of a short, tight section of track and the view is of the rear of the cars which after a number of laps becomes very frustrating. Depending on where you are in the stand you have a view of the pits that may be partially obscured by a footbridge. The best seats are at the back and left of the stand where you have the advantage of seeing the approach to the chicane. The stand is accompanied by a TV screen to help follow the race. An iconic view of the cars snaking through Mirabeau and Casino. 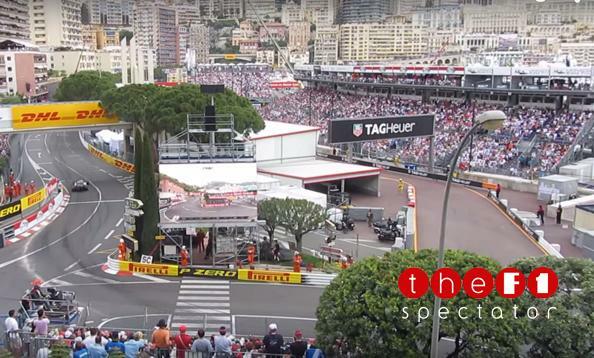 Casino is the most expensive grandstand at Monaco, but is it the best? Well it depends on what you want really. Perhaps nothing feels more emblematic of the Monaco Grand Prix than the view from this grandstand. There is no fence to ruin your view either. For keeping up with action on other parts of the circuit there is a giant screen in front of you. On the downside, while it’s a privilege to watch drivers work the wheel and find the perfect line through here there is no realistic chance of seeing over takes through this relatively fast left right section. A reasonably frequent overtaking spot in Monaco, this grandstand lets you looks over Portier and the corner proceeding it before watching the cars disappear into the darkness of the tunnel. This small intimate grandstand lacks the atmosphere and true Monaco feel that characterize grandstands in the swimming pool section and elsewhere. Grandstand V affords a view of the tight Rascasse and Anthony Noghes section and a rear on view of the lower end of one of the most buzzing start grids of the year. There is a very good, clear view of a TV screen directly in front of the stand. You might want to also consider Le Rocher as an alternative as the best spots in this general admission section actually offer as good if not better views, at a fraction of the cost. Grandstands beside the grid get a close up window on the most exciting grid of the F1 season. Great for celeb spotting and watching with fascination as teams and drivers prepare for one of the sports most anticipated events. If that sounds like something you really want to see then these stands are for you. Be aware though that once proceedings get under way you won’t see much else. The pits are on the opposite side of the pit building at Monaco and the podium is on the same side of the track, further down. Your view during the race doesn’t get much more exciting than some very fast, blurry looking cars driving past you in a straight line (through a wire fence). Le Rocher, or Sector Rocher is a steep hill above the Rascasse, beneath the Palace. It offers a wide view unlike any other at any circuit. 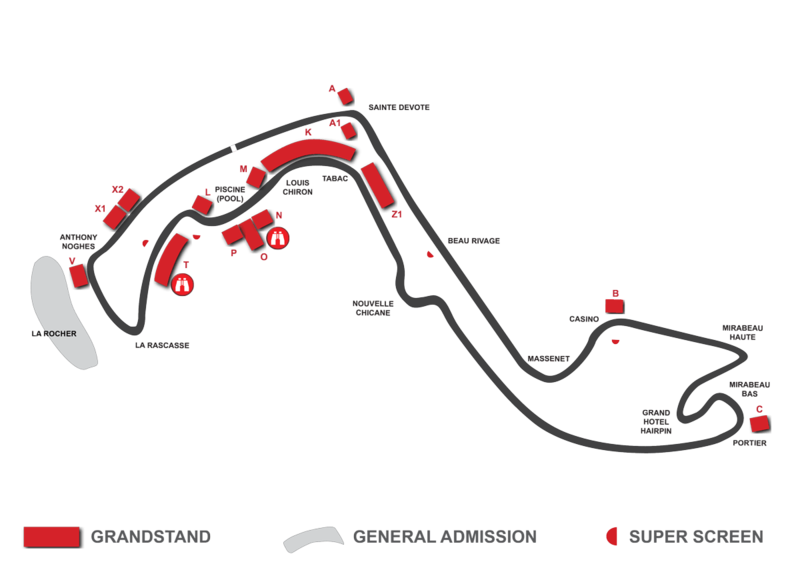 The vantage point offers a wide panoramic view extending from the exit of the tunnel, all along the waterfront and around to the exit of Anthony Noghes – where the cars are closest – right down to the lower end of the grid and pit lane entrance. There is even a giant television screen to keep up with the race. And the best part? All this costs only €70 on race day. Sound to good to be true? Well OK there are some downsides. Le Rocher is arguably the most divisive in opinion among F1 fans who choose to view the race from here. There are eager spectators who return year on year to Le Rocher for what they consider exceptional value in an otherwise very expensive place. After all, how many other general admission areas can you watch a Grand Prix from for under €100? And the views that are the most popular from this section really are fantastic. Still though, year on year fans turn up at Le Rocher without having researched it and are massively disappointed by what they see; make complaints to their ticket issuer, and in some cases request a refund. It’s understandable – from some vantage points the views are so disappointing it’s not even worth the effort to get to the track let alone the €70 price tag. When you consider the costs involved for travel and accommodation in the region and maybe a day off work, the fact that the tickets were only €70 won’t be much consolation. Whether the view is considered good or not will come down largely to where you are on ‘The Rock’. But there are other things to think about too. Lets take a look at some of the pros and cons of Le Rocher. If you do get a good spot here you'll think the asking price was a steal. Lower your expectations. This is a very low admission fee for any circuit, let alone Monaco. Get there early – 6am and no later. Camping out over night on the hill is even better. Only go if there is a group of you so there is always someone to look after your place. Have everything you need for the duration of your time on the hill. Take a mat or chair to sit on, food, water and a good attitude. Bring a decent pair of binoculars or a zoom lens to see the cars on the other side of the harbour.